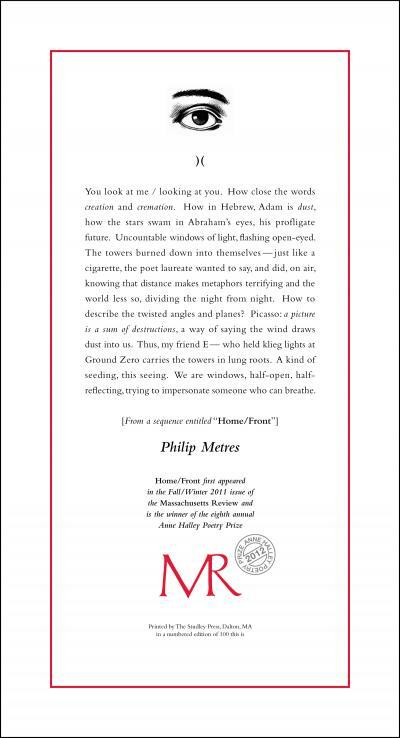 The 2012 Winner of the Anne Halley Poetry Prize is Philip Metres, for his poems "Home/Front" and "Air Aria," published in Volume 52, Issue 3/4. Philip Metres grew up in the suburbs of Chicago. He graduated from Holy Cross College in 1992, and spent the following year in Russia on a Thomas J. Watson Fellowship, pursuing an independent project called "Contemporary Russian Poetry and Its Response to Historical Change." Metres went to Indiana University, where he received a Ph.D. in English and an M.F.A. in Creative Writing, both in 2001. He is the author of a number of books, including To See the Earth (Cleveland State 2008), Behind the Lines: War Resistance Poetry on the American Homefront since 1941 (University of Iowa Press, 2007), Instants (a chapbook, Ugly Duckling Presse, 2006), Primer for Non-Native Speakers (a chapbook, Kent State 2004), Catalogue of Comedic Novelties: Selected Poems of Lev Rubinstein (Ugly Duckling 2004), and A Kindred Orphanhood: Selected Poems of Sergey Gandlevsky (Zephyr 2003). His writing has been translated into Polish, Russian, and Tamil. Currently, he is an associate professor of English at John Carroll University, where he teaches American Literature and Creative Writing.